Some of the problems are basic like the narrator’s frequent use of the phrase “say the mass,” when one does not “say” the mass, but prays the mass. That isn’t just a some insignificant distinction or nit-picking, but reflects an operative sacramental theology and theology of the eucharist, ministry and church. I think even my musical foils at CMAA would agree that the first phrase is akin to passing gas at a floral show. Even aside from the ideal sung Mass, that phrase conjures up the old notion that all one has to do is pronounce the words and grace happens. Clerical pelagianism and overtones of magic we do not need. Something more is needed. And say, while we’re at it, let’s excise “assist” too. 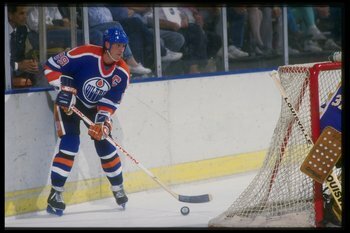 Wayne Gretzky was the master of assisting. The proper term is “participate.” We participate in Christ’s worship of the Father. On one level, to suggest we help the Mass along in any way by helping “father” is another kind of subtle but smarmy pelagianism. “Say the Mass” I agree with you. “Assist at Mass” has to do with Latin and was a common way in English to describe being present at Mass. In Spanish it still is the predominant term used to describe being at Mass or another event, where is English we would say attend. I don’t mind a bit of archaic English, as long as the priest describes the usage. Even as a reactionary, such words pass my lips. Must be the Sierra Nevada water. I read that the other day. Dan Horan is a personal friend of mine – a brilliant young man. We will hear more from him on all manner of things, very smart guy. And one of the nicest people I’ve met! Points well taken as regards preferring “pray” and “participate”, and retiring “say” (and its partner, “hear”). However, it is entirely fitting to say that we “assist” at the Holy Sacrifice of the Mass. Assistance is conscious active participation (indeed, “assist” traditionally connoted active participation, as opposed to “hear”). It is a joy and blessing to be reminded that our participation is inseparable from and utterly dependent upon Christ’s (and that of His minister). b.d.g., I see what you’re saying about “assist.” I think participate and celebrate are better verbs, and less apt to muddy. An altar server assists the clergy. A conductor assists the choir. An usher assists a person with a mobility impairment into a pew or chair. To assist implies being of direct service to someone performing a particular task. I have a pretty high regard for the Christian believer, but I don’t think what we bring is essential to Christ’s worship of the Father. Pleasing and edifying to God? Certainly. I wouldn’t say that lay participation is really dependent on the minister. Each baptized person is signated as a priest, and as such, we offer direct supplication and sacrifice to God. Granted, not in terms of confecting the Eucharist. But in the sense of proclaiming and receiving the Scriptures, and of the various forms of prayer in worship, we don’t “need” a priest, at least in terms of “utter” dependence.